Proofreading by Marisa, thanks a lot. Game of goosy gander, Two or three or four may play. EQUIPMENT : Four geese and an indicator with one arrow. Goosey Gander went out to call her neighbors, her little family safely housed at home. Upon her return, no children were to be seen. Nearly distracted, she ran hither and thither, but could find no trace of them. At last, she called her neighbors to organize a search for the lost ones. Three neighbors responded and they all started from space 1. Meantime the naughty children were wandering about the green grass in the centre of the board. 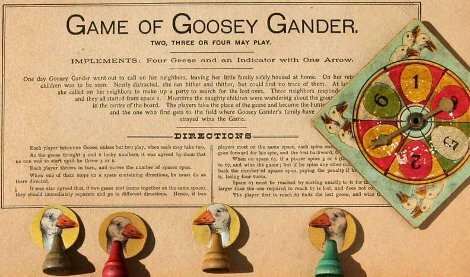 The players take the place of the geese and become the hunters, and the one who first gets to the field where Goosy Gander’s family has strayed wins the game. Each player takes one goose, unless onlu two play, when each may take two. As the geese considered 3 and 6 lucky numbers, they agreed that no one was to start until he threw a 3 or a 6. 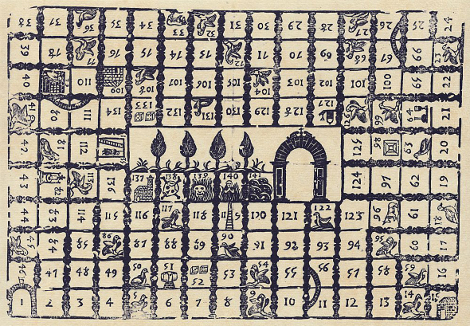 Each player throws in turn, and moves the appropriate number of spaces. When one of them stops on a space containing directions, he must do as directed. It was also agreed that, if two geese met (came together on the same space), they should immediately separate and go in different directions. Hence, if two players meet on the same space, each spins once... goes forward for his spin, and the first backward. 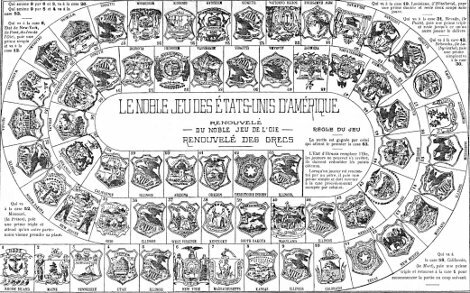 When in space 63, if a player spins 3 or 6 the ... to 67, and wins the game ; but if he spins any other number, he must move back the number of spaces spun, paying the penalty if he... is, losing four turns. To reach space 67, one must spin to land exactly on the space. A spin with a value larger than the numbers required to reach the space 67 results in a lost turn.